We are doing research work on the Grades 337 and 345 so we can get the price guide up-dated as to rarity. We need to do similar research for the Grade 304. 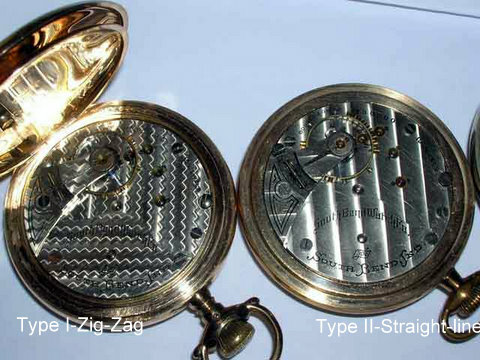 Specify the movement number, style of damaskeening pattern and other specifics such as Double Roller or Adjusted markings. Also important is the dial, whether it is configured as a hunter or an open face watch. Here are two Grade 304 with different damaskeening patterns, on the left is number 730160 which was sold as a hunter and 730800 a hunter movement with no seconds bit, sold as an open face with a flat, non-sunk dial. Is the South Bend 304 that scarce that nobody has any to report? Please post your serial numbers. Here is the number of a 304 called in to me by a friend who is not a member yet of IHC 185. Did you get which damaskeening pattern is on this movement. I am emailing him for that information. All of his watches are in a Bank Lock box so he has to actually go to the bank during business hours to get the information. He has a list of grades and serial numbers at home. As soon as I get the information from him I will post it. We have four listed out of one run of 1,000. I know that you South Bend collectors are holding back come on post your serial number or email me if you prefer to keep anonymous (jac4ky@aol.com). I have a 304 S/N 730077 with the zig-zag patten on the movment. I'm interested in your opinion on the matter of the the WAG of the temporal metrology of this project? Considering this and the earlier thread, how many examples, what sigma of certainty, etc. do suppose it will take. And what is going to take to at least have settled on some degree of consensus? WOW... Have you seen the new 2011 price guide. It now lists the 304 as a one star watch. We still need more serial numbers to add to the data base. ps Thanks to Lindell Riddle for presenting and getting changes made to the South Bend section of the price guide. It looks like that the only run of 1000 was split at the 500 mark. First 500 (73000-730499) were the Zig-Zag pattern with a second bit. The second half over (730500-731000) were the straight line pattern without the second bit. This should increase the rarity of the 304, as now we know that there are two patterns to collect. The Zig-Zag pattern which should be in a hunter case, and the Straight line pattern without the second bit (Special Dial) in a open face case. Any more to report? I just added one to the list 730349, which is a type I. Added another number today 730584. Interesting if we look at the list of Type II. A third type is clearly taking shape. Type II would be Straight-line Pattern with a seconds bit (true hunter). Type III would start at 730800 and be Straight-line Pattern No Second Bit (converted to Open Face). New serial popped out 730094 with second bit, zig zag pattern. and next one: 730671 - no sconds bit, stripes, recased.